This is a story of the youth of Yamato, when the gods still walked upon the Land of the Reed Plains and took pleasure in the fresh and waving rice-ears of the country-side. There was a lady having in her something of earth and something of heaven. She was a king’s daughter. She was augustly radiant and renowned. She was called the Dear Delight of the World, the Greatly Desired, the Fairest of the Fair. She was slender and strong, at once mysterious and gay, fickle yet faithful, gentle yet hard to please. The gods loved her, but men worshipped her. The coming of the Dear Delight was on this wise. Prince Ama Boko had a red jewel of one of his enemies. The jewel was a peace-offering. Prince Ama Boko set it in a casket upon a stand. He said, “This is a jewel of price.” Then the jewel was transformed into an exceeding fair lady. Her name was the Lady of the Red Jewel, and Prince Ama Boko took her to wife. There was born to them one only daughter, who was the Greatly Desired, the Fairest of the Fair. It is true that eighty men of name came to seek her hand. Princes they were, and warriors, and deities. They came from near and they came from far. Across the Sea Path they came in great ships, white sails or creaking oars, with brave and lusty sailors. Through the forests dark and dangerous they made their way to the Princess, the Greatly Desired; or lightly, lightly they descended by way of the Floating Bridge in garments of glamour and silver-shod. They brought their gifts with them—gold, fair jewels upon a string, light garments of feathers, singing birds, sweet things to eat, silk cocoons, oranges in a basket. They brought minstrels and singers and dancers and tellers of tales to entertain the Princess, the Greatly Desired. As for the Princess, she sat still in her white bower with her maidens about her. Passing rich was her robe, and ever and anon her maidens spread it afresh over the mats, set out her deep sleeves, or combed her long hair with a golden comb. Round about the bower was a gallery of white wood, and here the suitors came and knelt in the presence of their liege lady. Many and many a time the carp leapt in the garden fish-pond. Many and many a time a scarlet pomegranate flower fluttered and dropped from the tree. Many and many a time the lady shook her head and a lover went his way, sad and sorry. Now it happened that the God of Autumn went to try his fortune with the Princess. He was a brave young man indeed. Ardent were his eyes; the colour flamed in his dark cheek. He was girded with a sword that ten men could not lift. The chrysanthemums of autumn burned upon his coat in cunning broidery. He came and bent his proud head to the very ground before the Princess, then raised it and looked her full in the eyes. She opened her sweet red lips—waited—said nothing—but shook her head. So the God of Autumn went forth from her presence, blinded with his bitter tears. He found his younger brother, the God of Spring. “How fares it with you, my brother?” said the God of Spring. “Ah, my brother!” said the God of Spring. “You’d best come home with me, for all is over with us,” said the God of Autumn. “Still I will go,” said the God of Spring. “And so I think,” said the God of Autumn, and went his ways. Then the young God of Spring went to his mother, who loved him. “Do you love me, my mother?” he said. “You love her, my son?” said his mother. “More than a hundred existences,” he said. So she spread a couch for him, and when he was asleep she looked on him. There was no sleep for her the live-long night, but she went swiftly to a place she knew of, where the wistaria drooped over a still pool. She plucked her sprays and tendrils and brought home as much as she could carry. The wistaria was white and purple, and you must know it was not yet in flower, but hidden in the unopened bud. From it she wove magically a robe. She fashioned sandals also, and a bow and arrows. In the morning she waked the God of Spring. The God of Spring rubbed his eyes. “A sober suit for courting,” he said. But he did as his mother bade him. And he bound the sandals on his feet, and slung the bow and the arrows in their quiver on his back. “Will all be well, my mother?” he said. “All will be well, beloved,” she answered him. But the Fairest of the Fair lifted up her eyes and looked upon the God of Spring. And in the same moment the wistaria with which he was clothed burst into flower. He was sweet-scented, white and purple from head to heel. The Princess rose from the white mats. Hand in hand they went together to the mother of the God of Spring. Now the tale is told, and all the world knows why Spring is fresh and merry and young, and Autumn the saddest thing that is. If you enjoyed this story, try James' story, The Star Lovers. 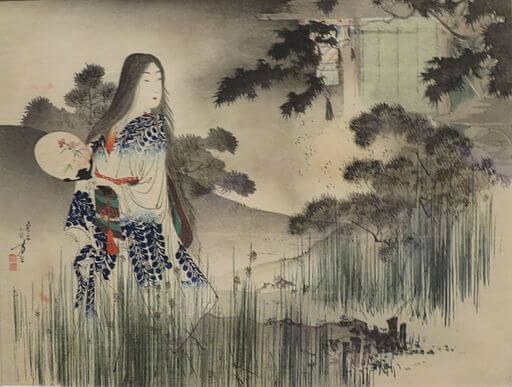 You may also be charmed by the elegant haiku poetry by Matsuo Basho. Add The Spring Lover and the Autumn Lover to your own personal library.